Karen Roy has lived most of her life in a wheelchair. 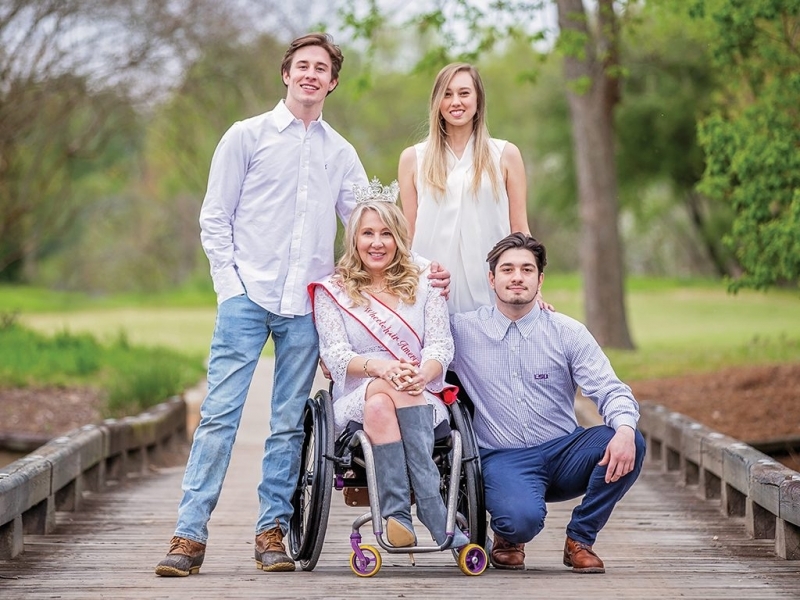 When she was 19, she was shot in the back during an armed robbery, resulting in a complete T-10 spinal cord injury. After being told she would never walk again, Roy remembers her first question, “Can I still have children?” The answer she received was yes. “At that point of my life, all I really knew was that I wanted to be a mom. As long as I could do that, I would be fine,” she says. Roy is the mother of three young adults, Caroline, Austin and Joseph. She and her husband, Phillip, who passed away in 2016, were married for 20 years. Now that her children are out of the house, Roy has turned her attention to advocacy as Ms. Wheelchair America. Her platform is Stand for Life. “Stand for Life has a double meaning–obviously, physically for me, it means to stand up as much as possible to improve your health. It’s also meant to stand up for your rights to have the technology that makes you healthier or more independent,” she says. Through her recovery, Roy learned about electrical stimulation bicycles and different standing devices. “I realized early on they were the key to me being healthy again,” Roy says. Although doctors discouraged her, she told them, “But my legs are still attached to my body, and I’m pretty sure my skin, bones, and muscles still affect the health of my body.” Roy was absolutely right, and in the years since, she has never had a pressure wound which are often common among people who use wheelchairs. “Sitting too much has become an issue for all able-bodied people,” Roy says. “We’re learning how unhealthy it is to sit all the time.” People who need devices to help them stand must pay for those completely out of pocket, but Roy is working to get standing equipment covered by insurance. Roy works for Numotion, a custom wheelchair and medical supplies provider, which has been her main Ms. Wheelchair America sponsor and has allowed her the flexibility to travel. As Ms. Wheelchair America, Roy has been to 20 cities in 17 states so far.